This is a total lie!! How dare you say that Hello Kitty leaves damage and destruction in her path when all she leaves is love and kindness. How can you expect for anyone to take you seriously when you constantly distort the truth in an attempt to make Hello Kitty look bad when everyone knows all she brings is happiness?! You need to take a good, long look at how you are trying to deceive everyone for your own means instead of telling the truth about Hello Kitty. We won’t stand for these constant lies! The questing is should it be Dear Daniel, He’s got the hair. Any I get and wave a Hello Kitty tattoo in your direction. Heck yes, a chewbacca hk would be awesome. Just what, precisely when you get down to it, is the point of having anything HK tattoed on your body? I mean, you eventually grow up (probably not in Darlenes case) and will realise you’ve had an extremely cheap and tacky tattoo done that will never leave you. I mean, its the ulitmate tramp stamp isn’t it? Cheap, tacky. corporate tat that makes you look like you have the brain capacity of a stunned kitten. Chavs everywhere will want one innit. Always open for some new fresh ideas 🙂 I was thinking about doing a michael jackson one actually after he died but didn’t get around to it. Tramp stamp? I know of some guy with or planing Hello Kitty Tattoos. 😀 Belated thanks to Brian for another of his excellent designs. Horrid ( mostly because there is something very creepy about anything with 8 legs crawling out of anything …AND I’m not into tats of any kind…bet you love it though ! Wow, a crap anime and a crap pop-culture icon. Two bad things that go worse together. ….I checked this guys deviant account, and found he did an Ash from Evil Dead hello kitty tattoo…Oh the horror….and not the good kind either! D8< That is just wrong!!! On so many different levels!!! 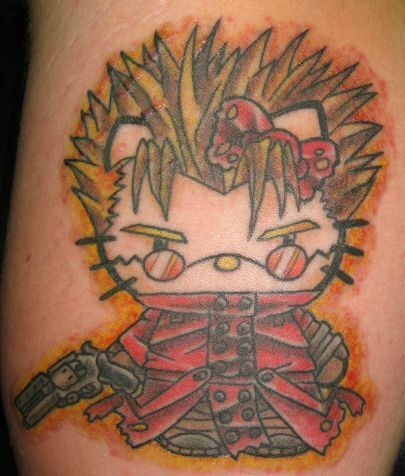 Vash is NOTHING like Hello Kitty!! They should NEVER be melded like this!! I LOVED that anime, and this combination is an abonimation! DX Hello Kitty should BURN!! !